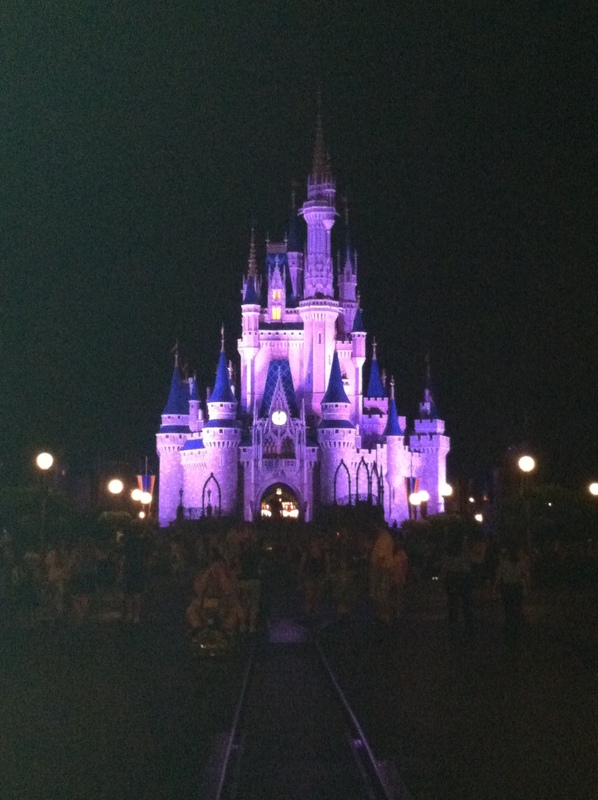 WIAW: What I Ate…in Disney World!! 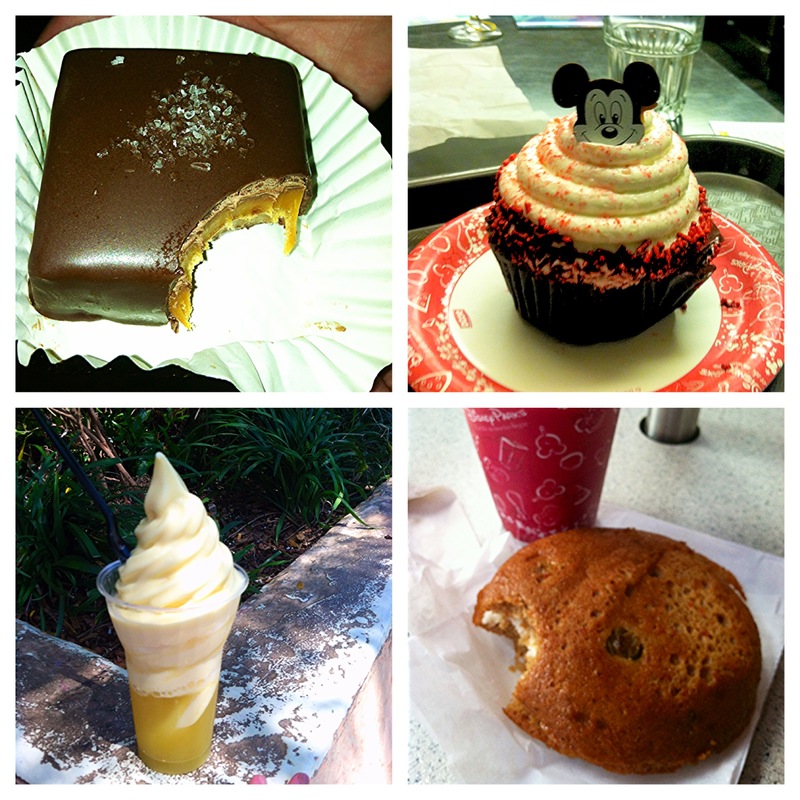 I ate a LOT while I was in WDW, so I’m starting off with the best of all: Disney sweets and treats. 1-Dark-chocolate covered caramel with sea salt from Karamell-Küche in Epcot’s Germany pavilion. See the size of that thing? That’s ALL caramel, covered with *just* enough chocolate. Even I, with my mountain of a sweet tooth, could barely finish the thing! 2-Red velvet cupcake from Contempo Cafe in the Contemporary Resort. This cupcake was recommended to me almost as soon as I walked in the door–how could I say no? But I know what you’re thinking: “Gee, that looks an awful lot like buttercream frosting. But Alex, being the huge red velvet fan you are, you must know you need cream cheese frosting!” Totally agree. Good thing it’s filled with it. 😉 Yup. Heavenly. I ate the whole damn thing. 3-The classic, the quintessential Dole Whip float. So famous that this was my first one ever. Pineapple soft-serve with pineapple juice. Super refreshing! 4-Carrot cake cookie sandwich (two large carrot cake rounds filled with cream cheese frosting) and coffee in Hollywood Studios. Breakfast of champions. 1-Coffee ice cream in a sprinkle- and chocolate-dipped homemade waffle cone from Ghiradelli’s in Downtown Disney. Awesome bus-riding snack! 2-School bread from Epcot’s Norway pavilion: a savory-sweet bread filled with sweet custard and topped with icing and coconut. I didn’t love it as much as I’d hoped, unfortunately. 4-And of course, a classic: the Mickey Premium Bar! Your basic vanilla ice cream-dark chocolate shell combo, but the mouse makes it special! He’s posing in front of another classic fave: Space Mountain! 1-Venturing into the treat, away from the sweet momentarily. Chips with chipotle salsa and queso dip from La Cava de Tequila in Epcot’s Mexico pavilion. Salty, cheesy, spicy–YUM! 3-Back to the sweet (cause it’s me): Maple Crème Brûlée from Le Cellier in Epcot’s Canada pavilion. I had this the last time I was in Disney–2 years ago–and have been thinking about it ever since. Hands down the best crème brûlée I’ve ever had. 4-More frozen treats–frozen banana covered in chocolate and peanuts. I had two of these, they were that good. And SO simple–I’m totally making these at home. Also the breakfast of champions. 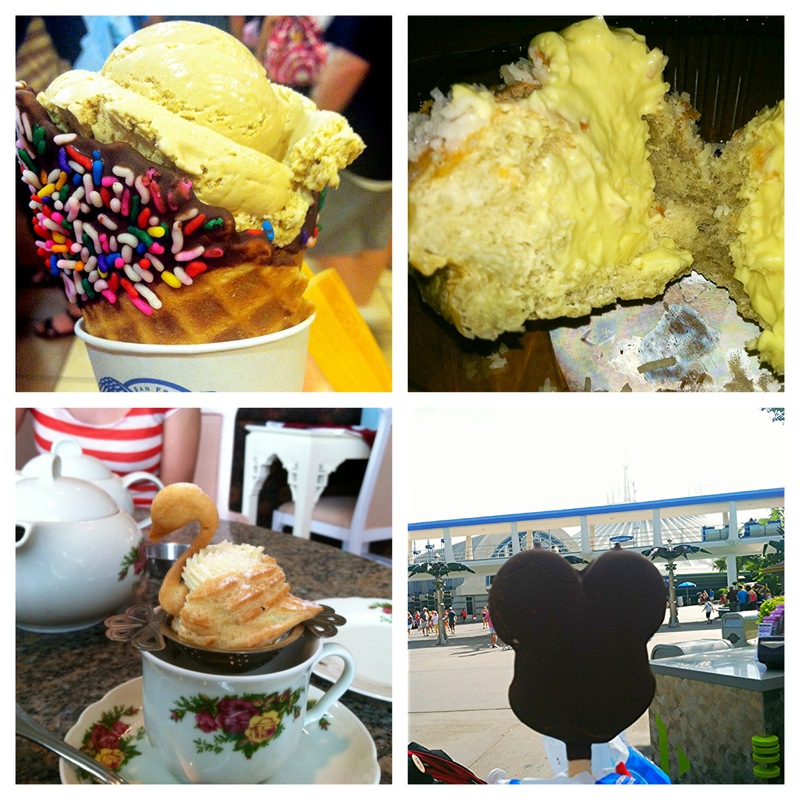 So, this is the last week of Jen’s awesome WIAW theme of “Summer Staples.” Does Disney food count as a summer staple? I sure think so! Well, there ya have it, folks. 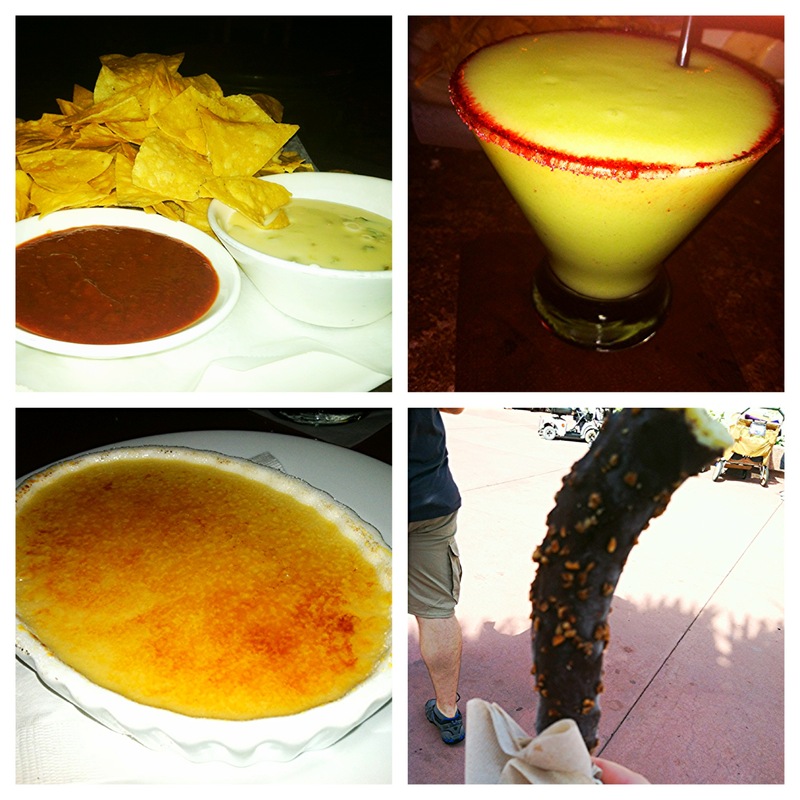 Installment 1 of what I ate in Walt Disney World. Are you drooling yet? If not, no worries–there’s more where that came from! Am I the only person in the world who can’t make kale chips? It’s no secret that I don’t bake. I’m just not good at it. I mean, last Christmas I had a pretty successful cookie-making run, but that was not without help. (In the form of both human and Kitchenaid stand mixer.) But overall, I’m not a baker. I can cook on the stove top, but once that oven turns on, it’s hit or miss for me. 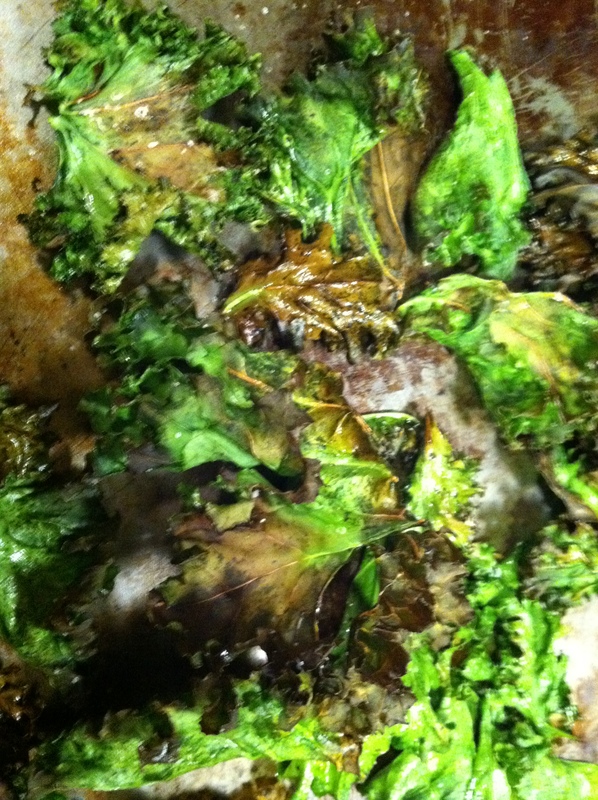 Which is probably why, even though everyone and their mother are making kale chips, I managed to burn them. Yup. Not even five minutes in the oven and I burned ’em. Just in case anyone needed further proof that I can’t bake. Now, here’s where you, my lovely readers, come in. I’m going to tell you what I did, and hopefully someone out there will be able to tell me where I went wrong. 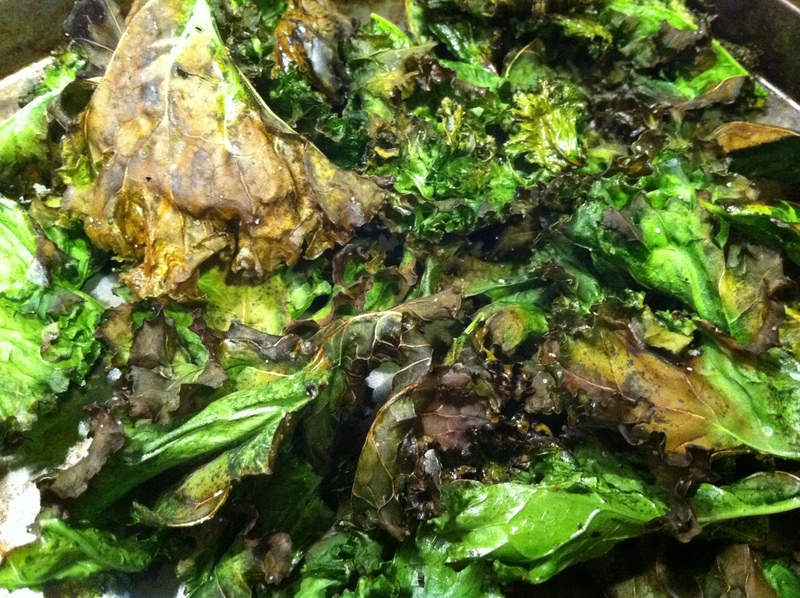 Because seriously, if kale chips are so hot right now, there must be a reason, and I want in on the secret, dammit! I am not going to return to burying myself in a bag of potato chips. 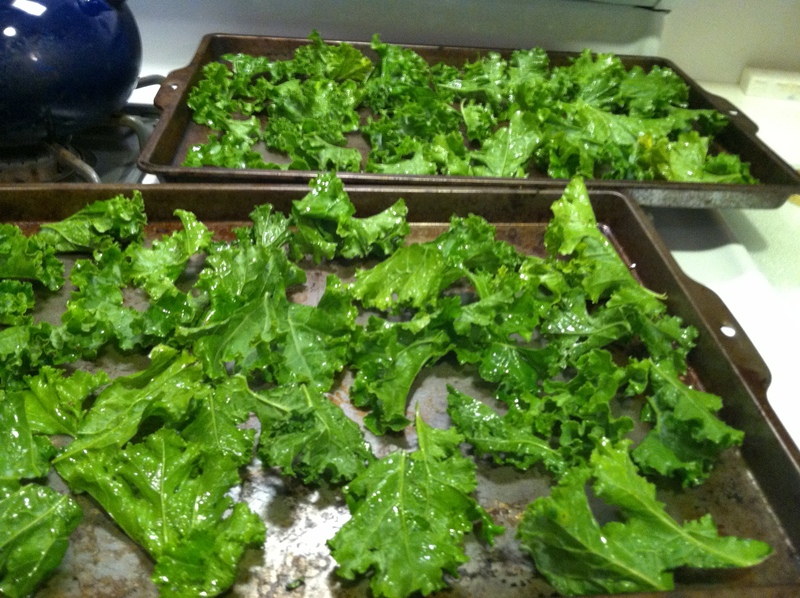 I will make successful, tasty kale chips! I took roughly half to 3/4 of a bunch of kale, cut off the stems and tore the leaves (leaving the center stems behind.) I laid them out on paper-towel lined baking sheets to dry and covered with more paper towels. After they dried, I tossed them with olive oil, salt and black pepper, then laid them back out on the baking sheets (sans paper towels), sprinkled with a little more salt and pepper, and into the oven they went (Preheated to 375F.) One sheet was on the middle rack, one on the top rack. Five minutes in, both racks were starting to burn. Alas…this happened. Though it may be a lot funnier than if I had succeeded, it still bums me out. 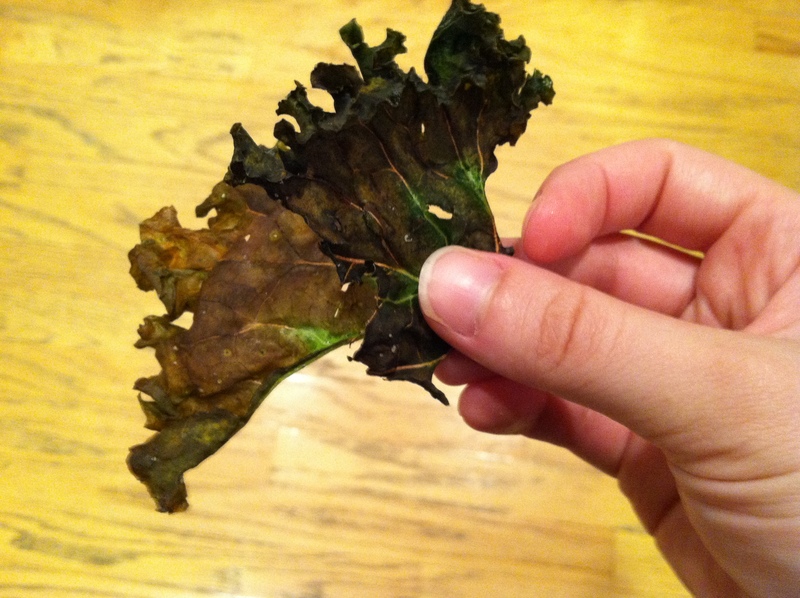 Plus, my house reeked of burnt kale. The night before a showing. That wasn’t so good. So, tell me…where did I go wrong?? Phew! It’s been a very writing-intensive couple of days for me. Between banking articles for work and banking posts for the blog while I’m on vacation, my fingers have been getting quite the typing workout! 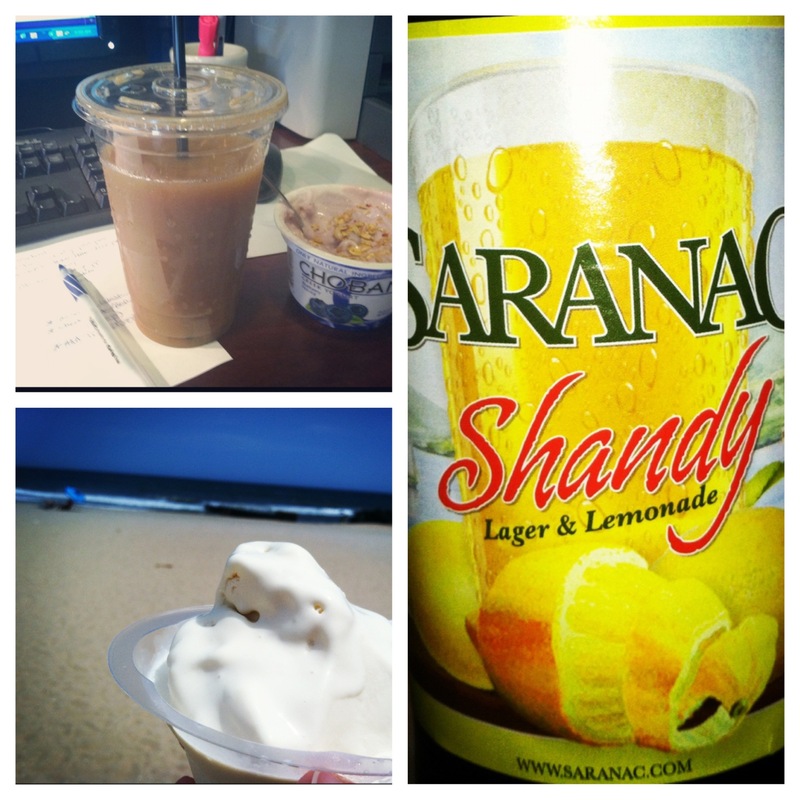 Now, this month’s WIAW theme is “Summer staples.” (Thanks Jen!) 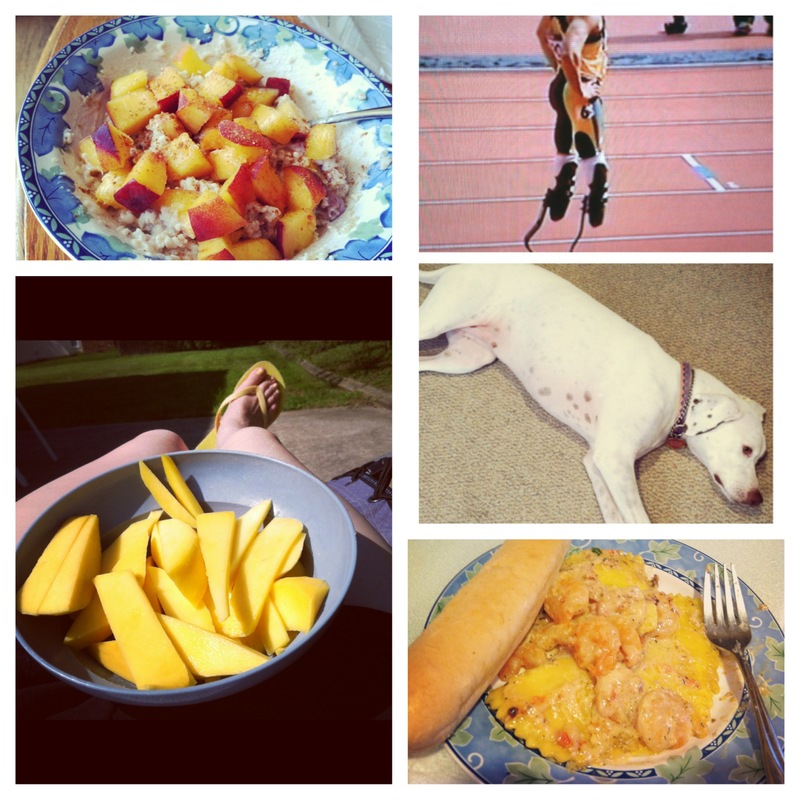 I think a couple of my eats below (see mango, ice cream and shandy) DEFINITELY qualify as summer staples! I will let you know, though: these are technically weekend eats from two weekends ago, not this past weekend. I got so busy last week (Wednesday in particular) with vacation errands, work and details (like making centerpieces) for my dad’s wedding that I didn’t get a chance to post my summer weekend eats, so I’m sharing them with you all this week! Breakfast: McCann’s Irish oatmeal with a teaspoonful of strawberry Chobani and a chopped peach, topped with ground cinnamon and ginger. Mmmm. It was actually kind of a late breakfast, and I ate while watching this really cool guy place second in his prelim heat with Nikki. She was significantly less interested than I was. [side note]: Is everyone else as sad as I am that the Olympics are over?? Lunch/snack: A cut-up mango and the rest of the strawberry Chobani from breakfast. Dinner: This one’s got a little bit of story. Kevin and I had decided to cook a good dinner that night, since we were both off and had the time. Then, about 10 minutes after I watched Pistorius race, my power went out for, like, 4-5 hours. So that sort of killed the cooking dinner plan–neither of us wanted to cook in a place with no AC, plus it’s much harder to ignite the stove and we were trying to keep the fridge closed as much as possible. So we decided to go out to dinner. A few days earlier, I had been cleaning out my room and came across an Olive Garden gift card I got for Christmas. It seemed like a good a time as any to use it. Is Olive Garden the pinnacle of Italian cuisine? Not in the least. Is it particularly healthy? Not really. Is it fairly quick and cheap and relatively tasty? Yup, especially with a gift card. Lunch: Vanilla ice cream at the beach. Seriously. I popped over to the boardwalk after work (I know you’re jealous, it’s ok). I planned on stopping at this Korean taco stand that opened there this summer and is supposed to be really tasty, but it was 90 bajillion degrees and there was a “new” ice cream shop. I say “new” because it was really just a new location for a shop the next town down the boardwalk that’s pretty famous for its ice cream. So of course I had to stop in. And I was feeling like some simple, good, pure ice cream, so I got vanilla, which is pretty uncharacteristic for me. 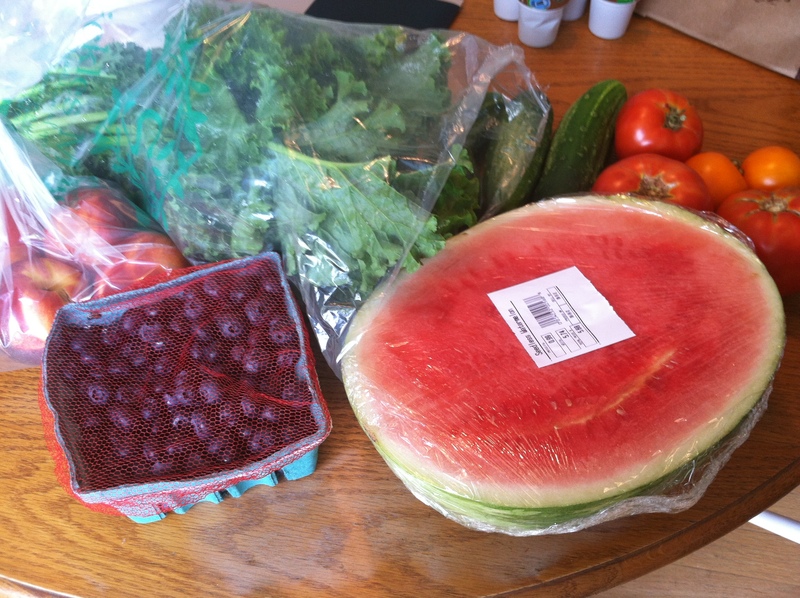 (My usual orders typically involve cookie dough, gummy bears and/or chocolate.) And it was damn tasty ice cream. Dinner: Possibly my new favorite summer beer, Saranac Shandy (seriously, this stuff’s possibly even better than Leinenkugel’s Shandy, my long-time summer favorite) with some suspiciously brown Pad See Yu. Well, that’s it! I’m focusing my energy on vacation now, because when I leave my office in the next five minutes, I’m officially on vacation! 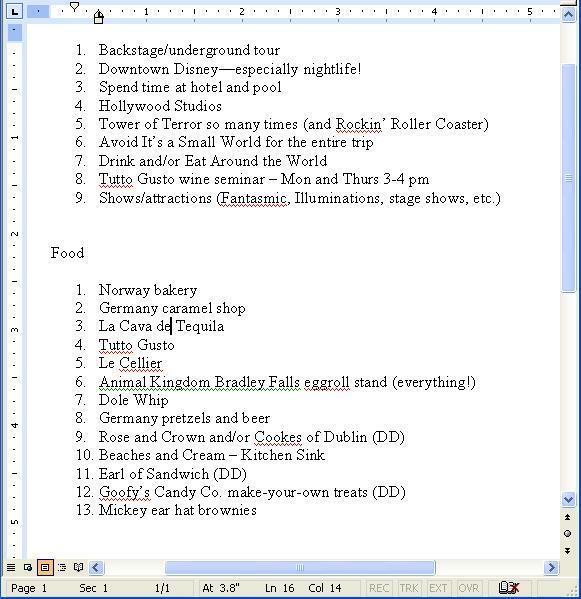 And I’m going to DISNEY WORLD tomorrow! I’m entirely too excited. OH…before I go–Happy 100th birthday to the one and only Julia Child! Bon apetit! It’s August, which means there’s still a month or so of summer left (almost two, technically) and still plenty of grilling and barbecue opportunities. Also, it means we’re coming into the hottest days of the year, and hot, heavy food just doesn’t always sound so appealing. Sometimes, in the East Coast heat, I just want a cool and refreshing snack or light meal that will leave me satisfied but not weighed down. 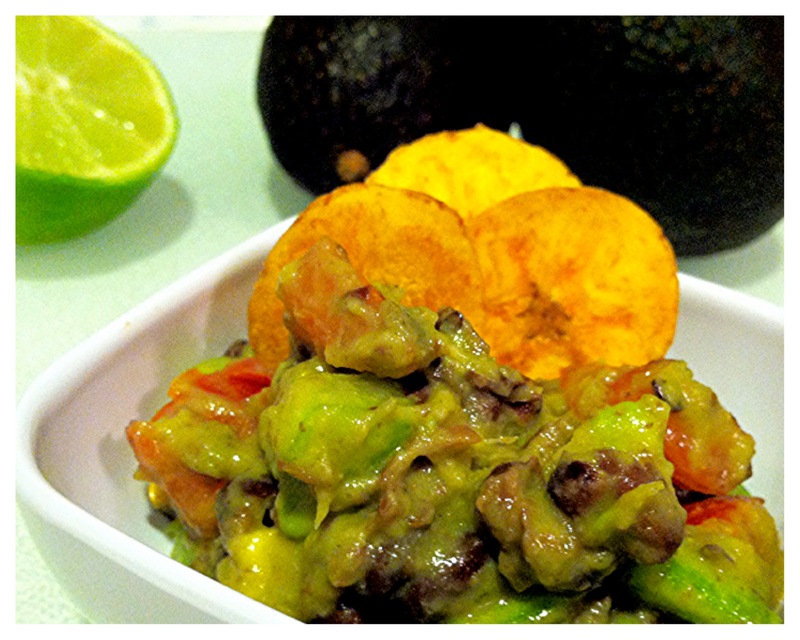 And that, folks, is how I got my avocado-black bean salsa. 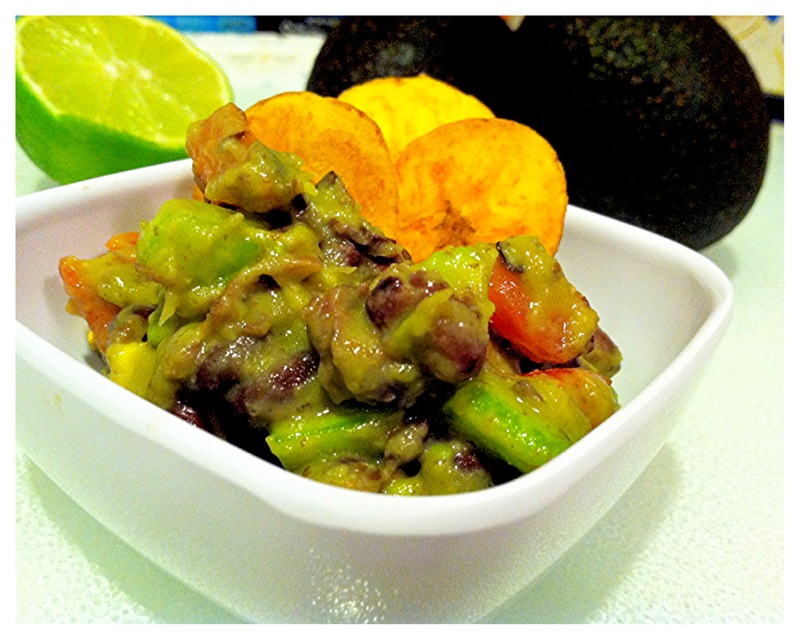 I made this stuff on a whim one night after I bought ripe Haas avocados and some canned black beans. 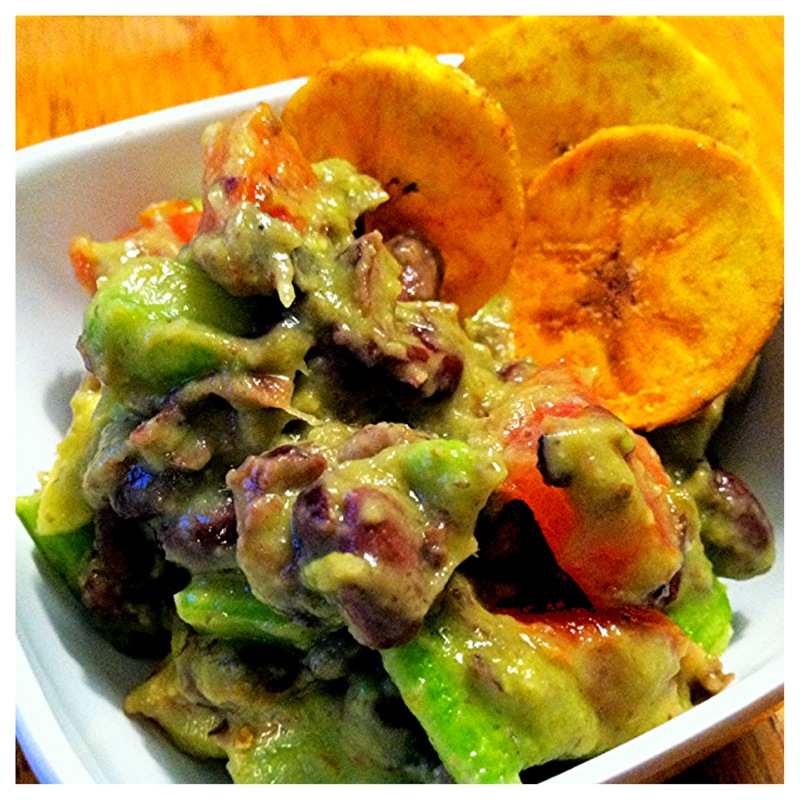 Served with some super-addictive Trader Joe’s plantain chips, I couldn’t put this stuff down! I ate it for dinner, a late-night snack AND lunch the next day! It’s the perfect summer snack and an awesome side dish to bring to your next barbecue–a fun and nutritious way to mix it up from regular salsa or mayo-laden picnic salads. Seriously, make this salsa and you’ll never want to stop! It will become a staple for your summer, for sure! One thing I’d like to note: I always look for no salt added canned beans–they’re much more convenient than dried beans, but canned beans are notorious for their sodium content. Rienzi sells all sorts of no salt added beans, which I love, so my pantry’s stocked with black beans, cannellini (white) beans and chickpeas. I still rinse the beans, though, to get off any extra salt and to improve the texture (they’re still canned in liquid, so they are a little slimy otherwise.) By rinsing them, it also allows me to almost completely control the amount of salt that goes into my food. This is so fast and so easy, and it brings a bounty of veggies and a healthy dose of protein and fiber to the party!